Rain had been pouring in El Salvador for 2 days already by the time me, Carlos Escalante, and volunteers from His Children Foundation, were on the road to Tasajera last Saturday Oct. 17. It had been one year and two months since I last saw Carlos, and he picked me up outside the house I was staying in San Salvador at 5:52am on that day. With grey cloudy skies and raindrops in my face I made my initial approach to the island; I was walking into my new workplace. Volunteers of His Children Foundation and the local women’s group Sea Artisans were scheduled to distribute to the community donations from Mansfield University; which included clothing, shoes, and toys. This activity was performed successfully and the donations were given to 200+ families. Surrounding the donations event, I made my goal to contact my most trusted ally in the community: Pastor Aristides Arce. The report from him was not as favorable as I expected. We sat under the palm hut behind his church, and I noticed he was hesitant to open up directly to me, waiting for me to express my intentions upfront. After a few minutes, we quickly regain the trust we were used to. He explained some community members were not satisfy with the way I have been helping the community, as they thought I was channeling help for certain groups and not to others. I explained to Pastor that I was aware of my lack of communication with the community, and that this time I intent to communicate well with the community leaders about EMANA and its vision with Tasajera regarding education. After a 1:45 hour long conversation and a hot chocolate and pastry, I was pleased with having his blessing. Later than evening, I met with Luis Recio, a Spanish student who is living in Tasajera since July and is working in there with a regional NGO called CORDES. 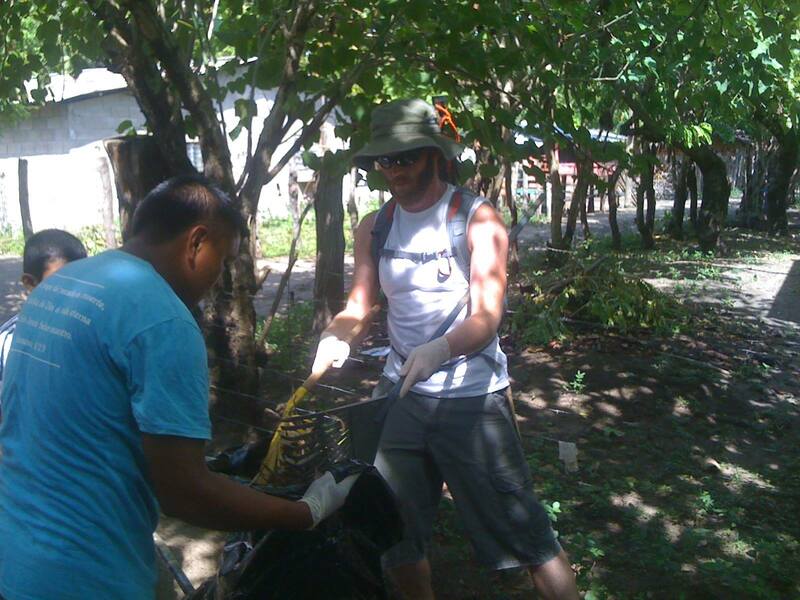 Luis is one of the many Alcala University students that volunteer every year in this region, and he is an Environmental Scientist. This was no surprise, as we knew we would meet up since early June when I was visiting Edgar Hita, director of Central America Cooperation program, while in Madrid. Our conversation with Luis was great, we agreed on working together in developing a waste management plan for Tasajera and carry out organic farming workshops together. Luis also agreed to provide support from his side to EMANA’s project to develop a Summer School Program and improve education in Tasajera. All in all, we are going to make great things together. Luis Rodriguez, a current EMANA member, was also in Tasajera and we agreed to work together in the development of the Steering Committee and ADESCO. Right before leaving Tasajera on Sunday, I met with Walter Pena, president of the Local Association for Development (ADESCO) to discuss the development of a Steering Committee with community members, school teachers, and other stakeholders to lead and oversee the School Program and other sustainable development goals. I left Tasajera Island with a clear vision of the challenges and opportunities ahead of me, and after arranging all the necessary things, I will return to Tasajera to start the implementation process at the end of this week. stay tuned. From July 31st to August 25th, I, Daniel Teodoro, was in El Salvador to work on a mission in the impoverished community in the Tasajera Island, off the coast of La Paz. 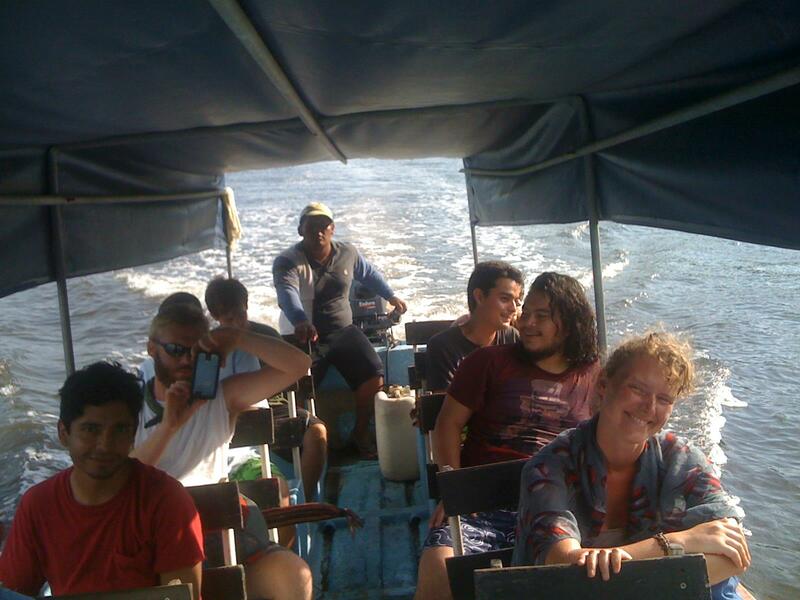 My work involved gathering a group of 10 college students, national and international, to visit Tasajera to work on 3 main projects: Women empowerment, community clean up, and village mapping. This year’s progress has been marked by unparalleled bonding, both within the EMANA group and with the community underlying the spirit of love and compassion. Our primary goals were (1) expanding Salvadoran student membership, and (2) strengthening community partnerships through project collaborations. Establishing a functioning organization in el salvador whose operatives are trustworthy, reliable, and efficient at project management has been a very important accomplishment for EMANA. 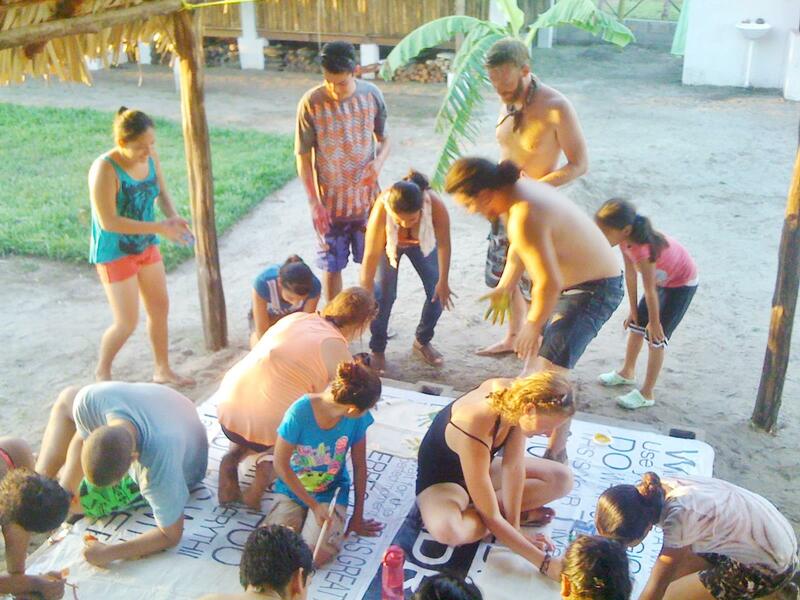 In order to accomplish our primary goals, we organized a week long volunteer camp in Tasajera. From Monday to Friday a group of people that didn’t know each other, but shared common Emana values, signed up for a week of service and learning. 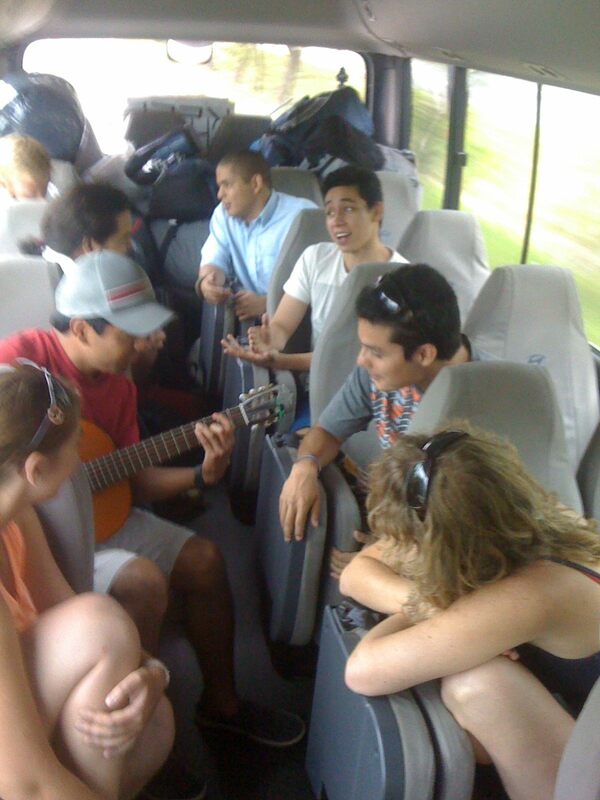 Six Salvadorans, one Brazilian, two Dutch, and one American bonded much better than expected. With a diverse range of academic backgrounds and schools of thought, diversity was a rich source of knowledge and perspectives that yielded great results. 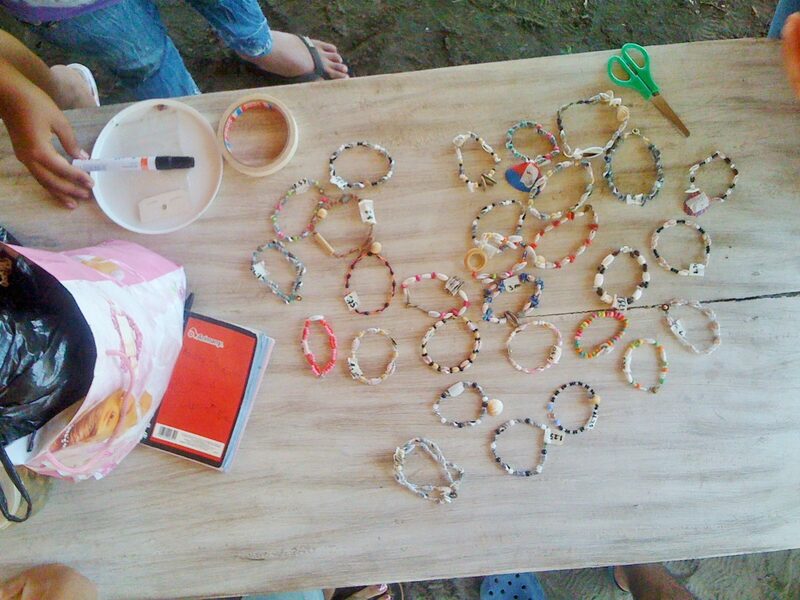 Throughout the week we worked closely with a group of young women that have been gathering twice a month on Saturdays to do handmade jewelry from seashells and other natural materials. 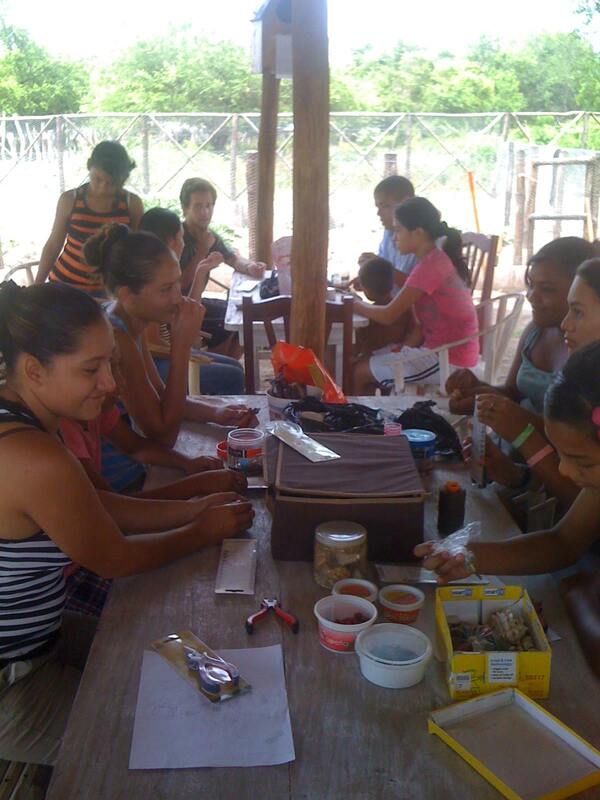 This group has been led by university student Carlos Escalante and funded by EMANA, with the initial goal of providing women the opportunity to develop their money making potential; most of the things they make are sold to tourists and locals. This project seeks to empower women through a space of sharing and encouragement of ideas; promoting interaction among women in a deeply machista community is a step forward in the protection of human rights. 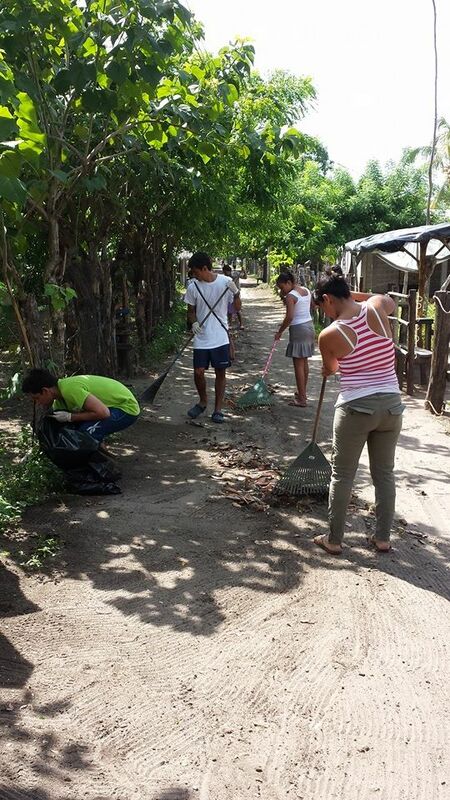 As the community of Tasajera aims to become an eco tourist destination, hoping that an increase in tourism can bring an increase in income to local families, a group of 20 young Tasajerans have been working together to clean up the streets of the community every Saturday; making the community more beautiful and appealing for tourist and locals alike. Under the leadership of Noemi, a 26 year old woman who claims she received the calling from God to assemble the group, the group called “Youth on Watch” have been operating for 2 years. Each member gets paid $13 a month for their cleaning services, and despite the symbolic amount, many depend on it to provide basic needs to their families in a time of struggle. 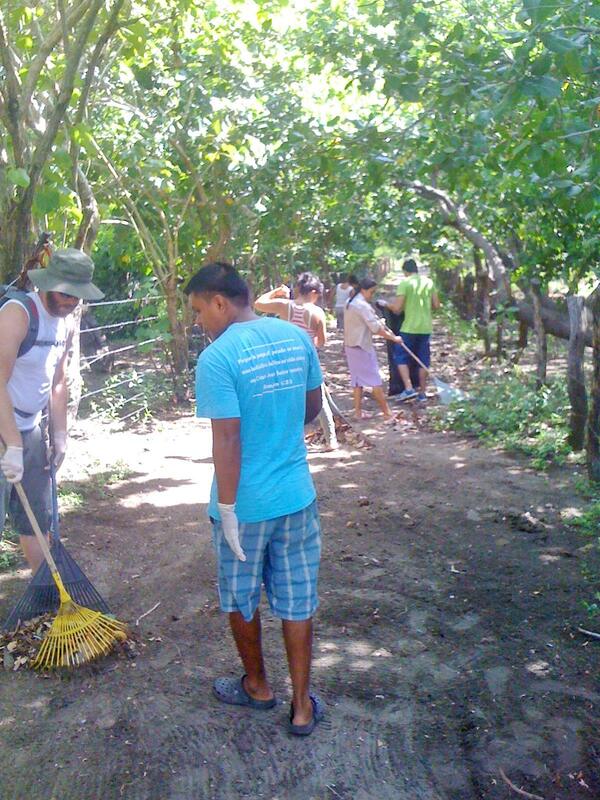 Our team worked with them for a day, alongside their team we set out to clean up the streets of Tasajera community in order to state two things: (1) We were there to serve the village, and (2) we believe that trash management is essential for a healthy environment. The last major project of the volunteer week was the development of a map of the community. This was an important project because of the lack of geospatial information of the community. This project had the initial goal of developing a map of the community that would facilitate visitors, missionaries, and tourists with a guide through the village containing features such as churches, schools, stores, police post, main ports, restaurants, common areas, and streets. With the professional assistance of Suzanne Marselis (The Netherlands) and the guidance of local Francisco Funes, the project came to a successful conclusion when the final map was handed over to the tourism cooperative of the community, who accepted our contribution as a significant step forward for the community in providing missionaries and visitors the tools to immerse in the community and its culture. The Tasajera experience is very special, because we don’t “advertize” our Christian faith on paper, instead we teach by example. Our team was instructed to follow the Christian values of EMANA and to filter every decision they make through the Jesus filter. 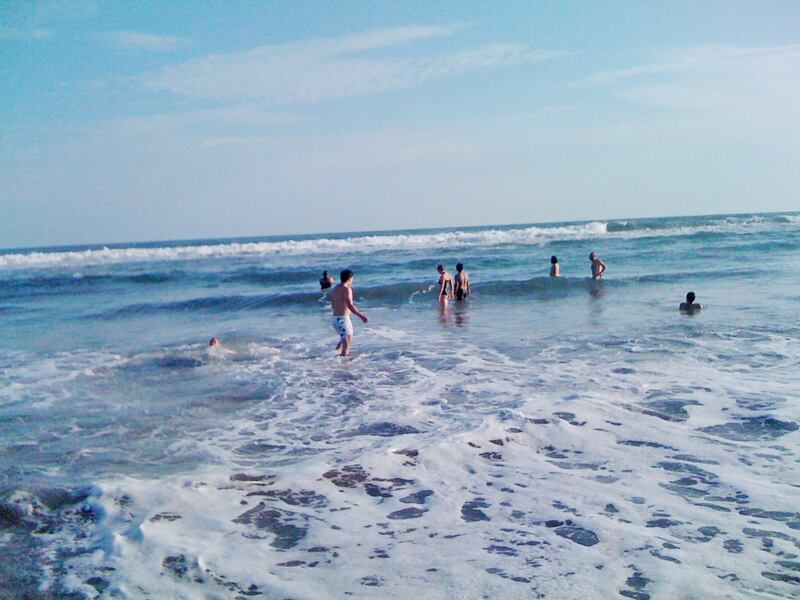 Various people expressed a shift in perspective experienced throughout the trip, moments that changed something in them and opened them more to the love of God. At different times, God worked on people through different means, some attended local churches for prayer, others worshiped God with musical instruments, and others asked that we pray for them. Many in the group were intrigued about what they saw in us and started to ask questions about God and how to sustain an intimate relationship with God that allows one to stand firm in Christ and not stumbling all the time. Constant conversation and teachings of the importance of prayer, service, and selflessness were constant throughout the week. For years EMANA has been focusing on developing a network of educated social operatives that can be reliable, trustworthy, and faithful to the EMANA values. The need to improve the implementation of development projects in impoverished communities is not limited to our group, in fact, this is the major concern of multinational non-profit organizations that fail to provide proper maintenance to expensive projects. I can say with confidence that our team has evolved into a full-functioning organizational structure, capable of providing the following services: (1) Community assessment, (2) project development and implementation, (3) logistics for international groups, (4) project administration and (5) research planning. The most important part is not the design of a plan, but the guarantee that such plan can be implemented successfully in a community with different culture, language, values, and social norms. Such is the specialty of EMANA, and this is why the structure we have achieved to this day is prepare to address the needs of the impoverished communities of developing countries. These communities are victims of environmental, social, and economic policies not limited to a single state or country, but rather to regional and global realities. We are just merely preparing ourselves to be experts at community development in anticipation of increase of poverty. EMANA is not a religious experience. However, it will be a highly spiritual one. Whenever one of us thinks about religion, we think of “GOD”, and then different thoughts flood our minds. Perhaps most of them are unanswered questions about the idea of a god. Philosophers are exceptionally skilled at developing those thoughts into more questions, hoping to reach a clear-cut conclusion, hoping to find peace in their hearts with questions of their mind. In EMANA, we don’t believe religion is God, or that God is a religion. We believe in purpose, and if anything exists, then it has purpose of being. To illustrate the point of purpose, try to imagine what happens when a baby is being formed after an sperm and and egg come together in a woman’s womb. Two different cells, of miniature size, come together carrying within them only a ‘genetic map’, the DNA, of what they are meant to become. Imagine the combined cell expanding and then splitting in half, then they continue to expand and multiply over and over again. As you picture this image, ask yourself how does each miniature cell knows ‘where does it belong?’ ‘what organ or body part is it meant to become?’. Of course the answer lies in the ‘genetic map’ carried within each of those billion cells. This is how one cell knows it’s meant to become a fingernail, and another knows it belongs in the eye. As humans, we can see ourselves as ‘cells’ of the larger human-kind body, carrying a ‘genetic map’ within ourselves. This map is what we, in EMANA, call purpose. We believe every human being has something to contribute to the world, and it’s of good and not harm. Sadly, many people in the world are blinded from their purpose and/or don’t know how to interpret their map. 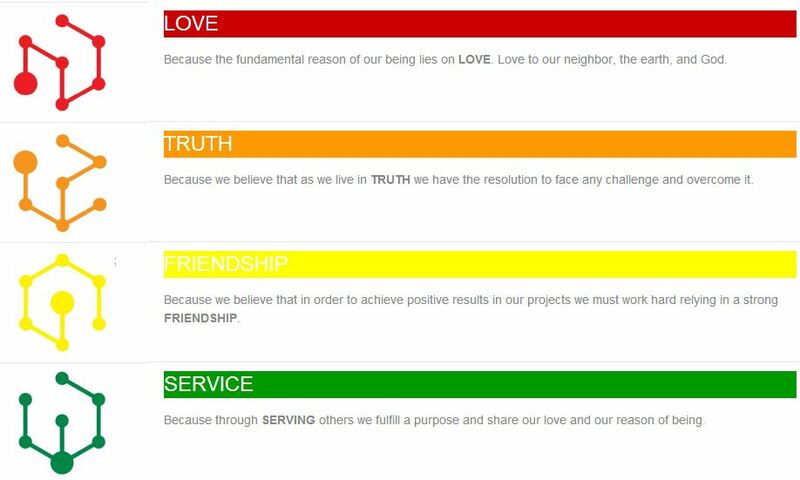 We believe that our purpose can be revealed through love… unconditional love. In fact, EMANA is the practice of unconditional love, doing selfless acts of love to help people in need, without expecting anything in return. It is EMANA’s goal and duty to assist the poor people of El Salvador and the world. We choose to act in good faith, with the shared belief that helping people not only fulfills a general humanitarian goal, but most importantly helps Us find our own purpose in life. This is not a theory, this is not something you can understand with your mind, this is the reason why EMANA exists in the first place. 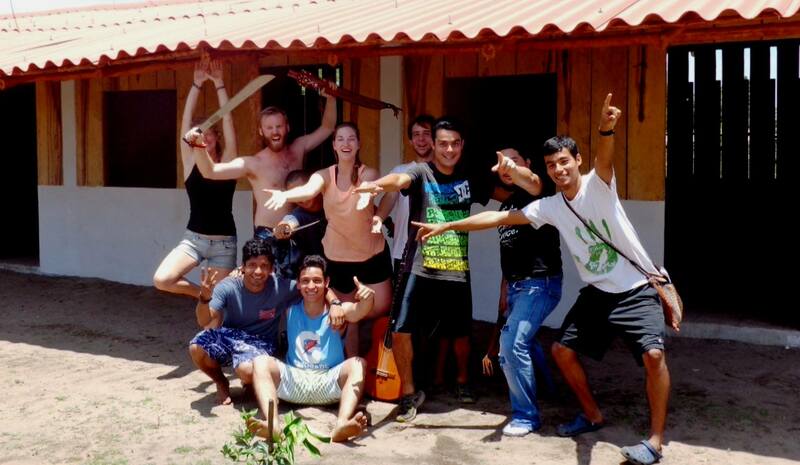 During an EMANA experience one thing is for sure: you will be filled with joy and love. After participating in our projects, most of the time, participants return to their lives being changed and with a different worldview; their lives change for the better. Many factors add up to a positive experience, among them are cultural exposure, selfless intentions, and a group of amazing people to share a new culture though a selfless perspective.